When Nova Communications expanded into Moncton, New Brunswick in 2015, we knew we were entering into a busy market. Our team, however, continues to expand – with three hires in the last year, including two Junior Technicians and a Senior Technician. The latest Junior Technician hire is Jessica Miller – who started with our team at the beginning of 2017. 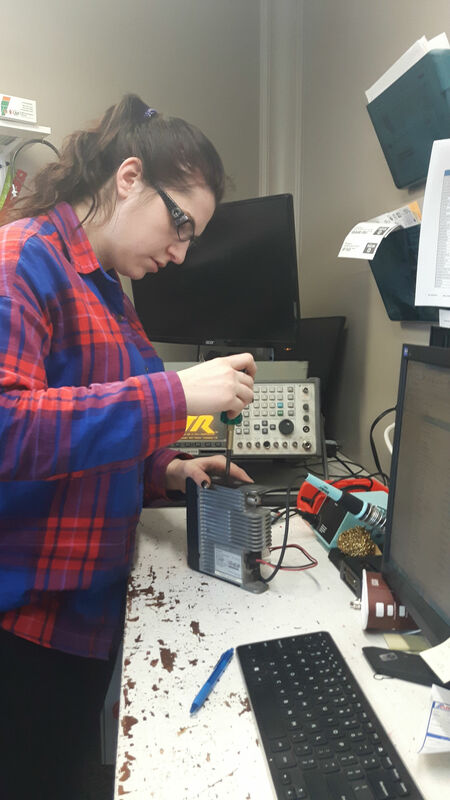 Jessica, a recent graduate from the New Brunswick Community College in Moncton in the Electrical Engineering program, will count Nova Communications as her first job in the field. The goal is to give Jessica the hands-on experience she needs to advance her skills, and get her more excited about her choice of careers. And that’s okay with her. And our team is keen to have her skills. Our Technical Services Manager Marc says Jessica is expected to be a “really good fit” for the now team of five in New Brunswick. “Our technical team in Moncton is very strong, and I honestly see Jessica strengthening it even more,” he said. And though she’s joining a male dominated industry, Jessica is breaking the mould, just like women of the past in STEM (Science, Technology, Engineering and Mathematics) industries. She says the Nova team and the industry has been very welcoming of her in the position – and while it can be challenging, she’s not letting that get to her. Jessica, at this point, will remain a friendly face in the Moncton office, able to service our customers’ needs and answer any questions they may have about the services we offer. In that position, she will continue to learn a skillset from hands-on experience from the other technicians working in the office – a great opportunity to learn in the industry. She added she may even be answering questions for someone under her at some point with Nova Communications – and that’s sure to happen with the pace the Nova Communications team has been growing in Moncton and beyond. Nova Communications has an office in Moncton at 601 St. George Blvd., Unit A in Moncton, or we can be reached at 1.800.452.4755. With more than 30 years in the two way radio business, our team of experts can help you with a number of questions you may have, so don’t hesitate to contact us today.